Le Labo recently launched a series of new limited edition perfumes (edps) in collaboration with Anthropologie, an eclectic purveyor of women's clothing and curiosities, including a smattering of niche perfumes. Having been very impressed with the small number of Le Labo perfumes I had already tried, I decided to check out three members of this special series (there are five all together), which for some unknown reason are priced drastically lower than the regular Le Labo perfumes, commanding a mere $62 for each 2oz bottle! Interestingly enough, upon receipt of my package, I discovered that the label on the front of these bottles reads, “From the Makers of Le Labo,” thus vaguely suggesting that it is not really Le Labo perfume. Still, the bottles are made of hefty brown pharmaceutical glass with thick bottoms, and the caps are painted heavy metal (not chintzy plastic), so the overall feeling is substantial and inspires confidence in the quality of the product. Whatever accounts for the fine powdery quality of Poudre d'Orient, I have to say that I am becoming addicted to it. Now that I know what's in the bottle, I find myself reaching for it more and more... The violet and vanilla mingle with the pseudo/quasi-cedar ("suede musk"?) powder to produce a very pleasing texture which is not very sweet and does not actually smell like vanilla (always good news for those who dislike vanilla frags...). The patchouli, too, is very low key—if detectable at all. Of course, that's a relative judgment informed no doubt by the preponderance of über-patchouli perfumes on the market today, many of which simultaneously offer super-saturated vanilla solutions. This creation is nothing like those, you may rest assured. BOUQUET BLANC (2010)According to the Anthropologie website, Bouquet Blanc is a “decadent floral composition of cassis, bergamot, jasmine, tuberose, and vetiver.” As clearly and accurately advertised by its name, Bouquet Blanc is primarily a white flower composition. The jasmine and tuberose are equal partners in this bouquet, and while the cassis may contribute to smooth out the blend slightly, it is definitely not detectable as cassis to my nose. Bouquet Blanc smells beautiful to me: not too sweet, not too sharp, not too dry. Just right! The composition is certainly nothing new, but it is a nice white flower perfume. This one is simple, not cluttered, and bright white, rather than gray and indolic. Like many big white flower perfumes, this one has good longevity and fairly big sillage. Anyone who has an issue with either jasmine or tuberose would definitely not like this creation, but white flower lovers should consider giving this limited edition perfume a try—if they can get their hands on a tester, which unfortunately is easier said than done. Of course, those who for reasons which remain inscrutable to me believe that "women have no business smelling like flowers" need not and should not apply! This perfume is unabashedly feminine. Salient notes (from www.fragrantica.com): cassis, bergamot, jasmine, tuberose and vetiver. BELLE DU SOIR (2010)I am truly baffled by Belle du Soir, which, for starters, is totally androgynous, with an emphasis, as a matter of fact, on the andro side. Then there's the huge disparity between the alleged notes and what I believe myself to perceive: a floral green with a dark foresty quality! Honestly, I was seriously debating with myself whether this was a floral green or a woody chypre! The last thing I would have guessed would have been an oriental (it is described by the house as "spicy") or floral woody musk perfume (the Fragrantica category). To me, Belle du Soir offers a splendid afternoon stroll through a dark green forest. I say afternoon because there is an invigorating aromatic quality to the opening. As strange as this may sound, this composition seems to me like a somewhat masculine olfactory neighbor of Chanel No. 19—believe it or not. Anthropologie describes Belle du Soir thus: “musky and rich, neroli, water lily and gardenia float above notes of cedar, sandalwood and patchouli.” Hmmm.... Perhaps there was a breakdown in communication between the lab of Le Labo and their marketing department? Whatever may be the explanation for the disparity between my experience of Belle du Soir and the house's or collaborator's description of this particular offering, I do like this perfume a lot, but it's a definite try before you buy! The name suggests Catherine Deneuve in the 1967 Luis Buñuel film "Belle du Jour" or the Fragonard perfume Belle de Nuit, which is similar to Dior J'Adore and Bond no 9 Astor Place. 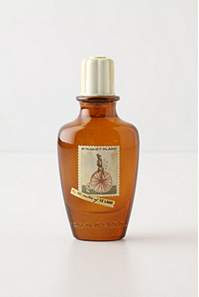 But Le Labo Belle du Soir could not be farther from any of them! Nor is this a patchouli perfume, oddly enough. According to my nose, this is a fairly aromatic, greenish-woody fragrance leaning toward the masculine side of the unisex line. I would not be at all surprised if some of the women who purchased this perfume scent unsniffed were disappointed with the disparity between the expectations built up by the name and their experience. Some may even have handed the bottle over to their beau! I am fairly sure that many men would enjoy this high-quality, invigorating composition, but the question is: would they be willing to scythe their way through the racks of billowy natural fiber gray-tinged triple-washed pastel clothing in order to get to it? Good news: it's also available on line for those who bravely blind buy. That's actually what I did, because I was unable to locate the testers amidst the piles of random stuff strewn all over the store which I visited. The Anthropologie stores really are a trip, filled to the brim with all manner of, well, for lack of a better term: random stuff! 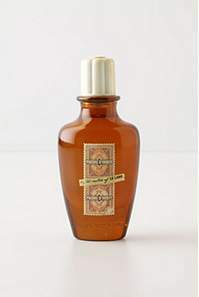 Salient notes (from www.fragrantica.com): neroli, water lily, gardenia, cedar, sandalwood and patchouli.